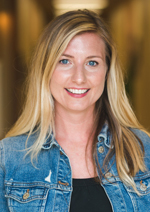 Anya McCormick is an internationally trained Montessori teacher currently directing Lower Elementary West. She has a special understanding of the needs of the child and helps mold creative thinkers who love to learn. She incorporates the physical and emotional needs of the 6-9 year old through daily activities both inside and outside of the classroom. A Montessori graduate herself, Anya also holds a B.S. from Wayne State University. She completed her lower and upper elementary Montessori training in Toronto, Ontario at the Toronto Montessori Institute. She earned a Master’s Degree from St. Catherine’s University where she focused on Montessori education. Anya has earned grants through the DTE Mini Grant Project, presented at various professional organizations and continues to coach Cross Country at Meadow Montessori, among other things. Anya and her husband reside in Monroe, Michigan and continue to enjoy remodeling their historic, 1897-built home. She also looks forward to helping others strengthen and combine both the physical and mental aspects of learning while creating independence in a caring and respectful environment. Anya McCormick can be reached at amccormick@meadowmontessori.org. Contact Meadow Montessori using the form below. Notice of Nondiscriminatory Policy as to Students: Meadow Montessori School admits students of any race, color, national and ethnic origin to all the rights, privileges, programs, and activities generally accorded or made available to students at the school. It does not discriminate on the basis of race, color, national and ethnic origin in administration of its educational policies, admissions policies, scholarship and loan programs, and athletic and other school-administered programs.